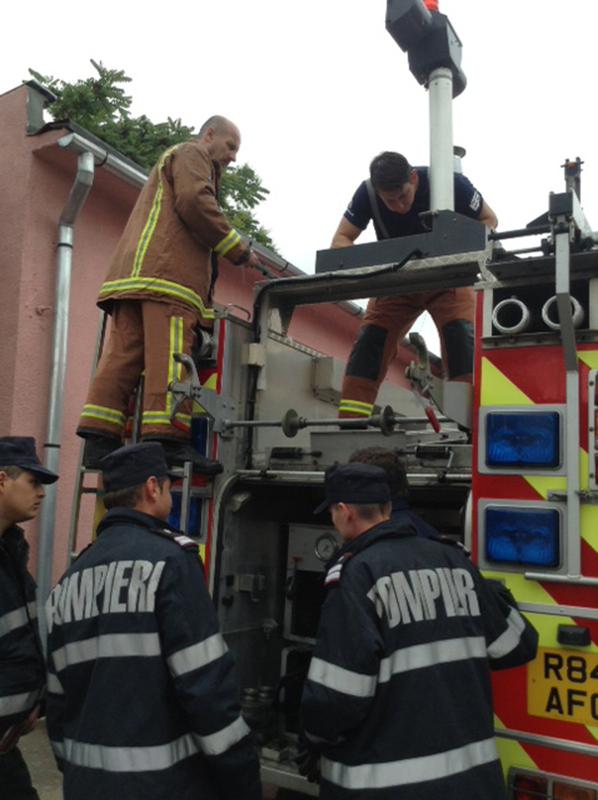 Shropshire firefighters have carried out a training session in Romania covered by national TV and press. They were familiarising Romanian firefighters in how to use equipment on board two UK fire engines transported to their country in a 1,800 mile aid trip destined to save lives in Romania's rural villages. A Land Rover and 500 pieces of protective firefighting uniform donated by Lion Apparel as part of the Beyond the Call of Duty Award were also handed over. Firefighters practised ladder handling techniques aboard the ERF and a Denis Sabre as well as how to use the high pressure pumping equipment, create foam, and for them to familiarise themselves with the right wheel drive vehicles. The fire appliances will replace ancient fire engines desperately needed in rural parts of the country. After the training Assistant Chief Fire Officer Steve Worrall presented certificates to 25 Romanian fire crew along with a bottle each of Gold beer from Ironbridge, a "hot can" of bangers and beans and chicken curry and rice used during lengthy fire incidents and a mug and pen. A total of 100 firefighters had stood to attention earlier to welcome the Shropshire Fire and Rescue aid convoy as it arrived at Targi Mures Fire Station in the south of the country. The British and Romanian flags soared above fire ladders as the convoy arrived. The Shropshire volunteers were earlier thanked by the town mayor and the president of Reghin Rotary Club which had bought one of the fire trucks in an event also covered by a host of local media. "I want to thank you all for your support in delivering our fire truck. It means so much to us." said Mircea Oltean, president of Reghin Rotary Club which bought the first of the two fire trucks delivered by nine members of Shropshire Fire and Rescue Service who each paid £150 to go on the trip and took a week's holiday. Senior fire officer Rares Petri, said: "These fires trucks from the UK will help save lives in Romania. They are impressive and will make such a difference." Another two former Shropshire fire appliances, delivered last October, are used on "virtually every incident," he added.